Season the cutlets with salt and pepper. Dredge the cutlets in the flour, making sure to get all the surfaces covered. Heat 1 Tbsp of the butter and 1 Tbsp of the oil in a pan. When it is nice and hot add the chicken and let brown for about 3 minutes each side, This will basically cook the chicken through. Wipe out any burned bits from the pan and add the final Tbsp of butter and of oil. Saute the shallots and garlic for 2 or 3 minutes until soft. 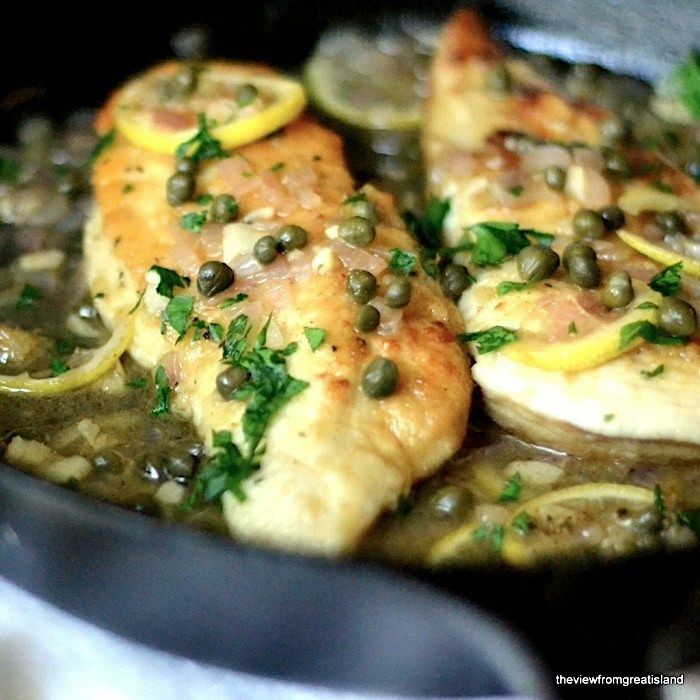 Add the wine and lemon juice to the pan along with the capers, parsley, and finely sliced lemon and continue cooking for a couple of minutes to create the sauce. Nestle the chicken back into the sauce, spooning it over the chicken. Heat through, and serve hot, garnished with more capers and parsley. If the sauce gets too thick, add a little water and reheat it through.